LARRY, MOE AND CURLY ARE AT THEIR HILARIOUS BEST IN THIS SPECIALLY-PRICED 2-DVD COLLECTION! Almost 80 years after the beginning of the Larry, Moe and Curly era, The Three Stooges have earned a well-deserved spot in the pantheon of comedy icons. As their timeless slapstick continues to entertain generation after generation, their legendary shenanigans have recently just been rejuventated for the big screen in a film from the Farrelly Brothers. 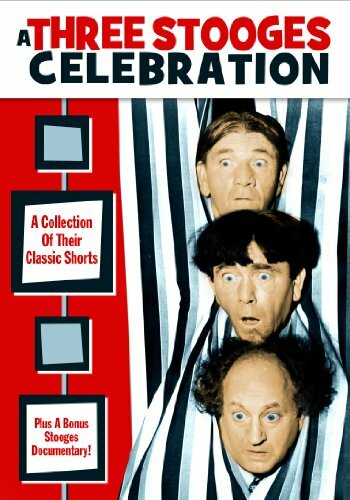 However, for those pining for the original comedic trio, look no further than Three Stooges Celebration from Entertainment One! Featuring over five hours of classic Stooge-mania on two-discs, the value-priced collection includes some short films, live footage of the boys from a TV show called "Camel Comedy Caravan" and the special documentary "The Three Stooges Celebration", an hour-long salute to Hollywood's most hysterical hooligans that traces their hilarious history! Entertainment One U.S. is the U.S. home video label of Entertainment One (LSE:ETO), a leading independent entertainment that specializes in the acquisition, production and distribution of entertainment content. Boasting a diverse library of feature films, television series and more, Entertainment One U.S. is the home of such notable properties as Sanctuary, McLeod's Daughters, Wire in the Blood, Omnibus and The Abbott and Costello Show, along with Ballet Shoes starring Emma Watson, Little Ashes starring Robert Pattinson and the 2009 Academy Award(R)-winning Best Foreign Language Film Departures. For more information on these and other releases from Entertainment One U.S., please visit www.eonehomevideo.com.